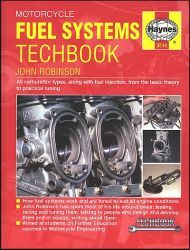 This book covers everything, from the airbox intake to the exhaust tailpipe, not only carburetors and fuel injectors. In between you'll find chapters on tuning as well as overhaul and troubleshooting. Finally, there are details on other areas such as turbocharges, superchargers, pumps, electronics, funny fuels and methods of testing, ranging from dynamometers to race tracks. All carburetor types, along with fuel injection, from basic theory to practical tuning. Note: this book supersedes #603 Motorcycle Carburetor Manual.